Since I'm surrounded by a lot of fabric and since I truly do love fine textiles with a passion, I thought it might be good if I dropped in every now and then with a fabric in focus. 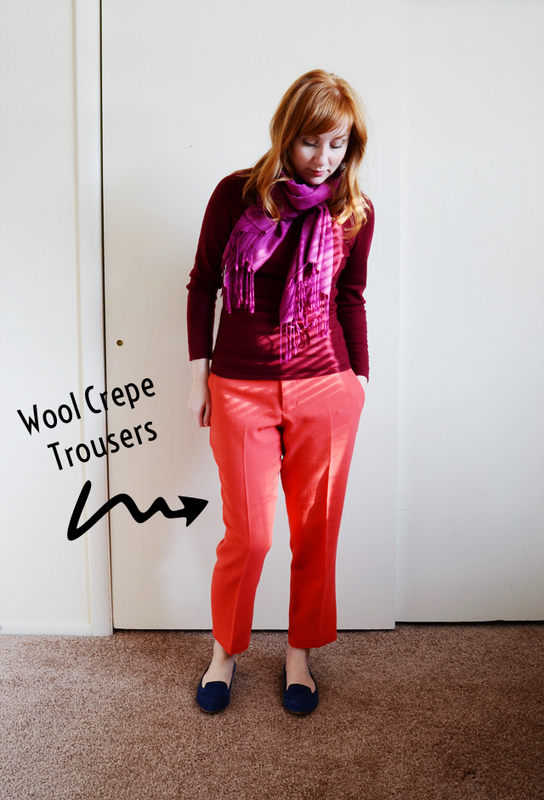 I thought I should stop down and talk about wool crepe because it is a rather lovely fabric. It's actually one of my favorites. Let's begin with the wool part and then we'll move along to the crepe part. Wool is usually made from animal hair and then spun into a fiber/yarn and then woven (or knitted!) into a cloth. Wool is usually, incredibly versatile and very easy to sew with and press. Getting along with wool is not hard, which is why to me its kind of like the cold weather version of cotton. Cottons are usually pretty easy to sew with and so are wools. Definitely not a stretch to add wools into your sewing arsenal. I'd say that the only thing with wool is that it usually needs to be lined, but don't be afraid to leave something unlined and just wear it with a slip too. Additionally, since wools are a protein fiber, they are prone to moths. While there is quite a bit of debate on how to keep your wool, I'll say that I keep mine in plastic tubs with cedar balls. The washing of wools is usually not recommended (though I'll admit, that doesn't stop me!) because they can shrink or felt if agitated in hot water. I usually pre-wash a wool in cold water, on a gentle cycle and then hang to dry. It's rare that I wash a finished garment out of wool - and that includes dry cleaning - but if I need to, I'll usually wash on gentle, in cold and hang to dry or hand wash and hang to dry. If the garment has a lot of internal structure as in the case of a coat or jacket, I dry clean and only if it needs it. Before any debate begins, I'll also say that if you're not into washing wools, that is of course fine too! Whatever blows your hair back! Crepe is a not specific to wool. You can have silk crepe (crepe de chine & 4 ply silk are both crepes) or polyester crepe. I've even seen crepe like knits too. Crepes happen when the fiber/yarn is twisted before its woven or knitted into cloth. It creates this bumpy like texture and is a little spongey. Wool crepe in particular has fantastic drape, but it's also structured enough to create a fabulous jacket that would last a long time. Sunni! Just what I was looking for (I think)!! I'm trying to find fabric to sew the new Simplicity 1254 coat. Would you recommend one of your wool crepes for that? The pattern suggests a mid-weight fabric. I'd love to see you make that coat out of a wool crepe! That hood! I LOVE wool crepe it's one of my all time favorite fabrics! I have quite a bit of it in my fabric collection and am always looking for interesting pieces to add. Thanks for highlighting this fabric! Thanks for this post Sunni! 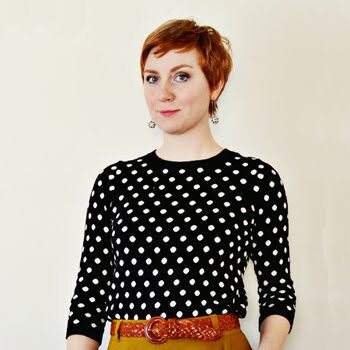 so helpful to learn from someone who actually sews and knows! Often I go into fabric shops here and and the people working there don't actually sew so have no proper hints and tips to give. I have a wool mix dress that I lined with a poly cotton, ( well it was a mystery purchase as It wasn't labelled in the shop and the owner gave me a bargain). I wash it all the time on cold- naughty I know-but it seems to come out OK! Wouldn't risk it on anything else though! What a great post! I love learning about textiles and being armed with knowledge when I shop. I think you should do a post like this at least once a week/month. An informed customer is a good customer! And not a knock on you because I know there is little to no profit in fabric, but wow. The cost. I'd love some wool crepe for a new dress, but I need 3 yards. Now we're talking a Ben Franklin on something I might mess up. That's SO intimidating. I was about to say the same thing...I am such a fan of wool crepe. I'm always looking for great colors. Thanks so much for this post! This is great to keep as a reference and I look forward to more fabric posts! Does the sale also apply to your brick and mortar shop? any professional thoughts as to whether one might suit the fabric a tad better than the other??? Thanks so much for this post Sunni. It is exactly what I've been looking for! I order most of my fabric online and often have no real idea what I'm getting. I think it would work if you added an interlining. Wool crepes are generally on the drapier midweight end, but I can definitely see a lightweight coat being made out of one. Or even just a coat that you wear to keep warm indoors. Heaven knows I'm always cold in the winter! I'm right there with both of you! One of my all time favorite fabrics. Such great texture and it loves to be made into just about anything, I have to say. Yum! This is good to hear! I know I'm always one for going into a shop where I can converse with the employees about a project and I LOVE it when they give me more ideas that I wasn't even thinking about! It's the best thing ever! Washing wools is a fairly personal thing. I've rarely had problems with it. That said, I don't wash them that often, if ever, but I am kind of a crazy about doing my own laundering at home. I say do what you feel comfortable with! Oh this is good! I'm so glad that this helps. I was wondering if it would be of interest to anyone. Sometimes I just assume that everyone knows everything and I definitely shouldn't. I don't, that's for sure! I definitely understand about these fabrics being expensive! They are. I do try to competitively price and I'll be doing more online sales in the future too! Woolens and silks end up being the most expensive, but when summer rolls around, linens and cottons are definitely not as pricey. Sorry for jumping on here a bit late, but no, this sale doesn't apply in the store. Unfortunately its very very difficult for me to keep track of inventory when its being sold in store and online so my quick fix for the moment is to have a sale in one or the other, but not both. Thanks so much for asking though! I'll definitely remember to make that better understood in future sales. Oh goodness! These are both darling and I can totally see that cobalt blue being great in either. I know, the color is to die for. I'm pretty sure you'll faint when you see it in person! Ha ha! As far as the patterns go, I think either would do just fine. So cute! I'm loving both neckline treatments on both patterns. Great picks! Thanks Tasha! Yes, I think that washing wools is a very personal thing. I've done it for many years as well and haven't had enough mishaps to stop. But I will say that I don't wash my woolens very often and yes, if in doubt, I definitely hand wash instead. Thanks for your input! I love the structure of a wool crepe dress or jacket, especially when underlined with silk organza. Oh please do more posts like this! Fabric cam be so confusing and like the above person said, there's rarely someone in store who can talk about it like this. I wish I lived in Utah! holy fast turnaround batman! my cobalt wool arrived this morning and it is indeed GLORIOUS! holy cow that color is so intense!!! this project had been slated a ways down in my queue, but it is so tempting to bump it up :) still, i think i will leave it further down, since i haven't made jackets before, and the two jackets ahead of it will give me good practice so that the cobalt jacket will really shine. thanks for sending this so quickly, and thanks for having such an amazing product! i know that some people are dismayed by the initial cost. but you get what you pay for, and in this case, i got quality (which means it should last for years), warmth, and drape, all in such an intense color i could squeal (except i am at work, but believe me, my internal monologue is full on, high pitched, glee right now). This is fantastic! I really have been wanting to get into sewing stuff, but I just get overwhelmed with the different types of fabric and what might go with what pattern. I found this really helpful, and I hope you'll highlight some more fabrics. a nice brief informative, how nice. 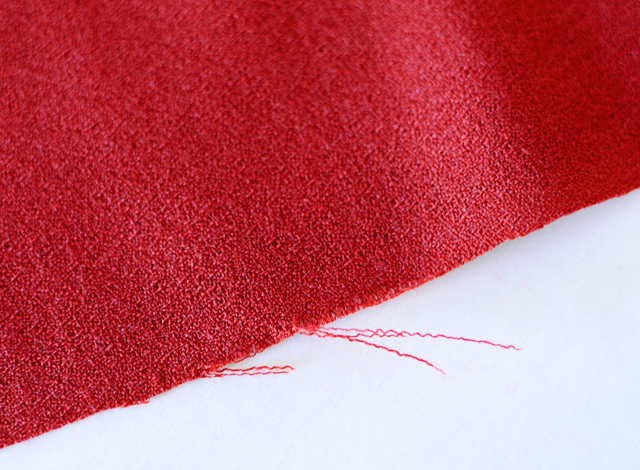 This post came at the perfect time because I'm about to sew a dress with a wool crepe blend! It's a wool/nylon/lycra stretch crepe in a gorgeous red color. I'm new to crepe and also new to linings. Is there a particular fabric choice for lining you might recommend?